2012 was a year of significant anniversaries in the world of hockey. It marked the commemoration of the birth of the rebel World Hockey Association 40 years previously, the first major level shinny fraternity to oppose the incumbent circuit since the Pacific Coast Hockey Association countered the NHA in 1911. Also, Canada’s historic triumph over the Soviet Union in the Summit Series in September of 1972 took place four decades before. It is still considered by many to be THE international tournament in the history of the game. Further, it was in October of 1952 that Hockey Night in Canada, our national sport, advanced from radio to TV—60 years ago that calendar year. Anniversaries are special. They bring back heart-warming memories—recapturing meaningful moments. In a sense they are monuments of courage, vision, and enterprise. 2014 commemorates 90 years of the operation of the Boston Bruin’s franchise—the first fraternity from the United States to join the world’s premier circuit, the National Hockey League. Its founder was Charles F. Adams, a sports enthusiast, who was also brought the Suffolk Downs Race Track and the Boston Braves baseball team into being. He had already been active in amateur hockey in Beantown. But in the spring of 1924 he was present at a Stanley Cup playoff match in Montreal, where the Canadiens hosted the visiting Calgary Tigers of the Western Hockey League. Not only was he bitten by the pro shinny bug, but determined to bring a big league franchise to the Hub. The story has it that Thomas Duggan had bid on the Canadien’s club when George Kennedy’s wife sold it following his death. Duggan’s bid was actually higher than that of Cattarinich, Dandurand, and Letourneau—but was rejected. To appease him he was given the privilege to sell two NHL franchises, with the stipulation that they be placed in major metropolitan centres in the United States. One was purchased by Mr. Adams for $15,000. Formal approval of his application to become part of the league was granted only 30 days prior to the start of the 1924-25 schedule. Much was to be done. He had crossed paths with Arthur Howie Ross while in the Mount Royal City, and engaged him to organize, stock, as well as manage and coach the fledgling club. Choosing the club colours was no great stretch, since Adams was owner and chairman of First National Stores, a grocery chain, decorated with brown and gold. In fact any animals which the new hockey icon owned—his thoroughbreds, his cows, his hogs, and even his hens—were brown. So it was no contest. Subsequently the name “Browns” was considered. But it was Adam’s secretary, a transplanted Canadian from Montreal, who suggested “Bruins”. Perhaps since the French word for “brown” in “brun”, it was an easy transition to attach that to the ferocious and tenacious nature of the brown bear. This colour scheme translated into a uniform with those tints, trimmed in white, with a bear’s head prominent as the team logo. Home games were staged in the old Boston Arena, the sextet’s home until the famous Garden was erected in 1928. The team’s first game was played on November 15th, an exhibition tilt against the Western Canada League’s Saskatoon Sheiks—a 2-1 loss to the visitors. Unfortunately, it was a forecast of things to come. The new kids on the block managed only 6 wins during a 30-game schedule, finishing dead last. The top scorer was Carson Cooper, with five tallies—compared with “Babe” Dye, the scoring champion, who had 38. The initial roster included several players from the PCHA and the WCHL—like “Sailor” Herbert (aka Herberts), “Smokey” Harris, “Alf” Skinner, and goalie “Hec” Fowler, formerly of the Victoria Cougars. It was just previous to season number three that the team’s fortunes improved. With the collapse of the Western Canada League (which had for one campaign embraced the remaining two clubs in the Pacific Coast loop—Vancouver and Victoria), a dozen first-rate performers were “free agents”. It was erroneously reported that Adams had paid $50,000. for the entire league, but in actuality Detroit basically transferred the Cougars from Victoria to the Motor City even adopting the fraternity’s handle. The newly formed Rangers inherited the Cooks and Frank Boucher. But adopting Frank Fredrickson, Duke Keats, Harry Oliver, and, best of all, Eddie Shore, to the Beantowners, made all the difference in the world. Two seasons later they topped the American Division in points, and in 1928-29 they carted away Lord Stanley’s coveted trophy. And they did it in fine style, sweeping both series on the way to the world championship, allowing only three goals in the five matches, and salting away three wins by shutout. By then they had supplemented a formidable lineup with “Tiny” Thompson between the uprights, and with Cooney Weiland, Bill Carson, and “Dutch” Gainor filling the cages of the opposition teams. Over the next decade the “graph” of success went up the hill and down in the valley. From first place finishes to an imitation of year one, they plodded on. It was early in that time frame that manager/coach Art Ross introduced an innovation, the initiation of which is seldom remembered, but the imitation of which is as common as breaking a tie with extra frames. On March 26, 1931, with 40 seconds remaining in a tilt with the Canadiens, down 1-0, Thompson was pulled from his cage and replaced with an extra attacker. The press highlighted it as “an amazing maneuver!” The tactic failed to gain a tie; but a trend was set in motion. Unfortunately, the most remembered headline during those 10 years was the “Edmonton Express” steamrolling Toronto’s “Ace” Bailey, which nearly resulted in the latter’s death, and Shore’s 16-game suspension for his reckless abandon. The Boston team’s donation of the entire gate in a subsequent game was next. As well, Shore’s move to the boards to shake hands with his victim during the benefit game, which was essentially the first NHL All Star contest, was heart warming. Finally, both in that contest, and in other arenas when the boisterous rearguard had returned from his suspension, loud cheering whenever he touched the puck countermanded the lingering irritation surrounding the hullabaloo. In 1938-39, the trumpets sounded again to herald the B’s taking home all the marbles. But this time the triumph was anything but a breeze. They barely squeaked by the Rangers, with four of the seven contests going into overtime, and the deciding match pulled out of the fire at the 8 minute mark of the third extra frame. The finals were more decisive, and, although the scores were close, saw the vastly changed roster defeat the Leafs 4 games to 1 to cap off the victory. The addition of Frank “Mr. Zero” Brimsek in goal, the smooth-as-silk Bill Cowley at forward, and “Dit” Clapper, who by then was a dynamic force on the blueline, were vital ingredients in the winning formula. 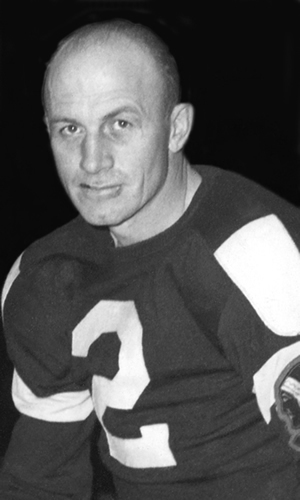 It was during the post-season that year than a comparative unknown, Mel Hill, suddenly gained the spotlight, scoring three sudden death overtime markers in the seven game marathon against New York. It gained him a nickname, which he didn’t always appreciate—“Sudden Death”. That playoff also brought to prominence one of the four renowned forward line combinations the Hub has boasted during its 90 years in the loop. Already the “Dynamite Line”, consisting of Cooney Weiland, “Dutch” Gainor, and “Dit” Clapper had carried the mail in the Bruins’ initial post-season success. This combination was comparatively short-lived, however, because both Weiland (who crossed swords often with Ross), and Gainor (who had a problem with tipping the bottle) were sent packing within three years. But the 1938-39 roster included Milt Schmidt, Woody Dumart, and Bobby Bauer, affectionately called the “Kitchener Kids”, but better known as the “Sauerkrauts”—later shortened to simply, the “Krauts”. That post-season they ranked 9th, 11th, and 16th in league playoff scoring. The very next campaign they were 1,2,3 in the regular season points derby, with Schmidt being awarded Art Ross Trophy, and Bauer recognized for his clean play as the Lady Byng winner. All three were chosen as All Stars. They skated together until 1942. Almost as famous was the “Uke Line”, a designation attributed to the nationality backgrounds of Johnny Bucyk, Bronco Horvath, and Vic Staziuk. The sobriquet was attributed to their common Ukrainian ancestry—although actually Horvath’s background was Hungarian. They jelled as a trio commencing in 1957, and continued to make their presence known until 1961. Their premier season was 1959-60, when Horvath came within a point of capping the scoring derby, and was voted to the Second All Star squad. Staziuk was 9th in scoring, and Bucyk, whose abilities seemed to grow with his advancing years (including two Lady Byng wins) was 15th. The fourth significant trio to sport the New England team’s colours were simply known as the “Espo Line”, with Phil Esposito maintaining the pivotal role. He was flanked by rugged Wayne Cashman and the skilled Ken Hodge Sr., who sneaked into the top ten scoring ranks on a number of occasions. “Espo” managed five out of six Art Ross Trophy victories from 1969 through 1974. The Black and Gold continued their high profile in 1939-40, finishing in first slot, then repeated their Stanley Cup performance in 1940-41. Schmidt, Brimsek, along with the newly-acquired Eddie Wiseman, and the veteran “Flash” Hollett rounded out the quartet of playoff Johnnies-on-the-spot. Throughout the 1940’s and 1950’s the Beantown contingent blew neither hot nor cold, for the most part finishing in the middle of the pack, almost always making the post-season activities, but not quite reaching the coveted summit of the loop. “Old blood and guts”, as he was called in the early days of his NHL tenure, was complemented in his on-ice philosophy, first by Sprague Cleghorn and Billy Coutu, both of whom were suspended for viciousness by their own manager, Leo Dandurand, when they skated for the Canadiens in the early 1920’s. In the 1930’s, Lionel Hitchman entered into that same spirit and, followed by Pat Egan and Fernie Flaman in the next decade, who happily donned the same mantel of meanness. As the 1950’s got underway, the Beantown management made no bones about the fact that they wanted members of their sextet to be “big”. The “rough” aspect of size went without saying. 175 pounds (which was considered to be a formidable weight in those days) was considered a minimum requirement. In reality, of the 1953 lineup of 20 players, 12 were six feet tall or more, and 14 weighed in at 185 or more. While the nickname, “Big Bad Bruins” wasn’t formally applied until the early 1960’s, in reality this characteristic was already in place for more than 30 years. It’s ironic that in 1953, when Coach Lynn Patrick took his troop into the Motor City for a match, the headline preceding the face-off was “Who’s afraid of the big, bad Wings”? Boston gurus, like SIHR’s Kevin Vautour, seem to agree that it was in the early 1960’s that the “big, bad” agnomen eased into common usage. It was not the result of some master plan set in motion by the powers-that-be during the Shore years—but rather an osmosis thing. “Terrible Ted” Green seemed to be the catalyst. His heartless spearing of the clean- playing Phil Goyette in 1965 seemed to set the pace for a new era of mayhem. Johnny McKenzie, Terry O’Reilly, Eddie Shack, Derek Sanderson, and Jim Harrison, continued to harass the opposition with their rough and tumble tactics. In February of 1969 Sports Illustrated headlined a feature written by Mark Mulvoy entitled “Bobby Orr and the Animals”. This five-page expose zeroed in on players named above, with particular attention given to Ted Green, whom he tagged as “the epitome of the bad guy”—Boston’s “policeman”. Already having established a mantra of “thuggery’, they beat Philadelphia’s “Broad Street Bullies” to the punch with their intimidation and dirty play. When they met on the ice it was mayhem incorporated! In one post-season clash they set records for penalties, 43 of them totaling 138 minutes, including a dozen majors, misconducts, and game misconducts. The fact that Boston won 5-1 almost seemed incidental. 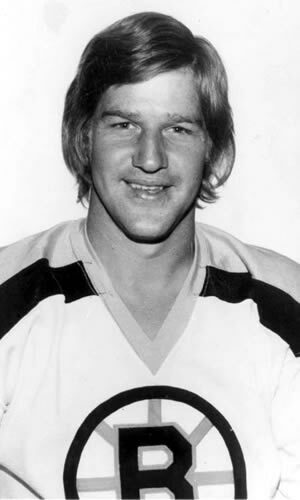 One journalist referred to “Orr’s rushes, Espo’s burly body in front of the net, supported by a group of muggers!” The addition of Wayne Cashman, Mike Milbury, and Terry O’Reilly in the 70’s only enhanced their reputation as hooligans. It’s hard not to conclude that two distinctive black marks on their reputation took place during that time frame. In 1969, of course, the infamous stick-swinging bout between Green and Wayne Maki rocked the hockey world. The former suffered a fractured skull and was in danger of losing his life. Maki was suspended for 30 games and Green for 13. Six years later Dave Forbes, another Beantowner, clashed with Detroit’s Henry Boucha. After being sent to the cooler, and freed from his sentence, Forbes attacked Boucha with his stick, causing permanent damage to his victim’s eye. On a more positive note, there are distinctive milestones which warrant recollection as well. For starters, the Hub management had the courage to be the first NHL team to thumb their noses at the colour barrier. On January 18, 1958 Willie O’Ree, wearing Bruin colours, skated onto the ice as the first black man to play in an NHL game. He participated in one further contest that year, then came back for 43 more games during the 1960-61 campaign. On a totally different note, this franchise must be credited with pulling off one of the most lop-sided swaps in league history. On November 7, 1975, Harry Sinden managed to pull the wool over the eyes of his Chicago managerial counterpart, Tommy Ivan. He traded Gilles Marotte, Pit Martin, and goalie Jack Norris, in exchange for Phil Esposito, Fred Stanfield, and Ken Hodge. The long-term results remind us there is no need to go there. Last, but not least, the B’s snagged the best hockey player who ever skated in the NHL—namely Robert Gordon Orr. While the league was on the verge of expanding, the Bruins were on the verge of exploding into a power house franchise, with the incomparable Parry Sound crackerjack ready to change the face of the game forever. The first NHL’er to win four trophies in one year, and the first blueliner to capture the Art Ross trophy, he captivated the imagination of fans, teammates, opponents and the hockey world at large with his ability to play at both ends of the ice, and to excel at both. It is sad that a gimpy knee shortened his otherwise memorable career in the Big Time. The old novelty song about “Grandfather’s Clock” recalls that “90 years without slumbering; tick tock, tick tock—with life’s seconds numbering; tick tock, tick tock.” This iconic franchise has never slumbered in those 90 years. Some seasons between their 1941 Cup triumph and their 1970 world championship—like 1956 for instance—their boat nearly beached on the sand. Yet, they keep on ticking. They repeated their grand slam in 1972, and once again in 2011. Yes, and came within two aces of winning it all last season. And, who knows? Maybe next year.